Some of you have been asking about the strange looking bus cruising the Orange Line this morning. It’s a prototype 60-foot articulated electric vehicle – probably the largest all-electric bus currently running in North America. It’s out for a five-day test run on Metro’s Orange Line. Metro has five 40-foot electric buses being built under a contract with BYD Motors Inc. at their facility in Lancaster. Delivery of these buses is expected in early 2015. The testing this week on the Orange Line will help Metro better understand battery electric buses and operating parameters. The low-noise, zero-emission buses are part of Metro’s continuing quest for greener, more sustainable operation methods. Existing electric bus technology presents a number of operational challenges for Metro. Electric vehicles typically have limited operating ranges that max out at around 150 miles per charge. This can make operating electric vehicles impractical for most of Metro’s lines. For the Orange Line, which at 18 miles each way isn’t a particularly long line, Metro typically schedules buses to run 250 to 300 miles daily. However, since the Orange Line runs right next to Metro’s Chatsworth division, electric buses can potentially drop in there to take advantage of mid-day charging to “top off” the batteries. The prototype electric bus is this week being tested for range, passenger comfort and operator opinion. The results are far from complete but the possibilities are exciting. As posted previously on The Source, these buses are part of a large effort to test clean-air prototype buses prior to the next Metro replacement bus procurement in 2016. Funding for the buses has been made possible through Measure R funds dedicated to transit operations. You know, there IS a type of all-electric bus that can run its assigned route 24/7, only going into the barn for maintenance. The SF MUNI has a fleet of them. They’re called trolley buses, and they have a pair of trolley poles trailing behind, collecting current from paired overhead wires. Thanks for again demonstrating the myopic view of the gang at One Gateway Plaza. Why, I gather that if you were to point the horselss carriage north of San Francisco, you might come to two more cities with 60-foot ETBs: Seattle and Vancouver! That’s exactly what I want to say. The initial cost for trolley bus may by higher than regular buses, but on the long run the operating cost and maintenance cost will be significantly lowered, especially for Orange Line, which has very high service frequency. I mean if we can’t get the Orange Line converted into a light rail line, at least we can convert it into a trolley bus line, right? What if they have a bigger goal that is lateral from our nostalgic ones for trolley buses on catenary power? Hear me out. Let’s also assume we live now. You know, when the goal is to bury or obscure all overhead wires because we live on a bunch of earthquake faults, tractor trailers can get caught in them, and — I’m sorry to say this — but everyone other than us transit geeks think the overhead catenary is ugly. Perhaps the plan is not to follow the known trajectory for electric buses. Perhaps they’ll be testing modular battery sets in the future. You pull the bus up to the district office, swap a couple cell boxes while the bus is in turnaround for the next run, and get going faster than a diesel or natural gas fuel-up. …or like that Sao Paolo underground charger. Thanks James, that’s exactly what I was thinking. Since Metro owns the right-of-way for the Orange Line installing caternary poles, and even solar panels along the line shouldn’t be too hard for Metro to accomplish. In SF, I believe, buses and streetcars share the same over-head wires. Does it have a bike rack in the front? I can tell for sure from the top picture, but it doesn’t really look like it. The prototype does not have a bike rack but the new 40-foot electric buses will. They’re too small to be running on the ever popular Orange Line, though. Initially, at least, they will be running out of downtown Los Angeles. C’mon, get with the program and genuflect to Glorious Revolutionary People’s Republic of China like our sellout politicians do. Besides, if I wanted to see wireless recharging, the trolley at The Grove was doing that over a decade ago! Why not just install electric cables and use all electric buses like they do in sf and Seattle? The Orange Line is fixed route. No need for batteries, too. SF does have all-electric articulated trolleybuses, as do Seattle and Vancouver. The technology for trolleybuses has been around for quite a while, indeed one of the earliest lines was built right here in LA just over a century ago! 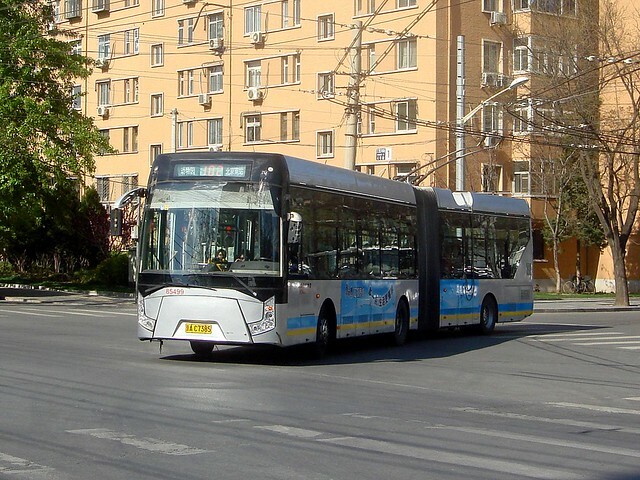 Traditional trolleybuses have had to stay on the wire, but with battery technology getting ever better, they have been getting better and better off-wire capabilities, and I think the ideal would be a trolleybus that can run on the wire on the major trunk lines, and then go a reasonable distance off the wire to branch out. But having to go only 1 or 10 miles means a rather lighter battery to be lugging around all the time. The silver lining here is that these battery-powered Orange Line buses could eventually be used for other bus routes when the Orange Line is converted to light rail in about 70-100 years. “converted to light rail in about 70-100 years.” ROFL! Battery power is zero emission *locally*, yes, but falls down every other way. Batteries don’t magically mine, process the elements and manufacture themselves without serious energy input and environmental disruption. At least trolley buses can be powered from diverse energy sources that work AT NIGHT, without wind, etc. Now, where do we find more of that copper for the OCS? I’ve only been aboard a MUNI trolley bus once when it had to go “off-wire” for a short distance (to detour around a stopped vehicle, as I recall), but they do indeed have that capability. And now that you mention it, I do recall seeing trolley buses in Seattle. 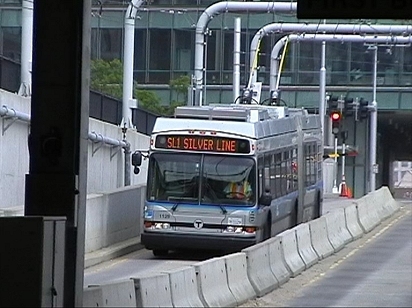 Up until it was converted to rail, the downtown transit tunnel used them (it now uses hybrid buses that normally run in battery-only mode while in the tunnel). I think I lost my original comment, but I don’t mind. I’m psyched for the electric test buses and hope to see their tested progeny on more Rapid lines in the future. I’ll admit I’m a trolleybus fan, and I love seeing the two-sled pantograph slide along a catenary power line above a street. I also realize we live along fault lines, truck routes, and other limitations that make that infrastructure prohibitive and atavistic. I also suspect that, much like that roadway field-effect charger in Korea, you are looking to test other aspects of the future of electrified transit. Perhaps modular battery sets: pop out a few cells during a turnaround at an office, and be back on the schedule faster than a liquid fuel-up. Since The Source now allows images, it’s easier to just post photos from Google Images. Electric buses, eh? What a wonderful, novel idea! An idea that’s already been in use all over the world.